Rowan Alexander "R. J." Barrett Jr. (born June 14, 2000) is a Canadian college basketball player for the Duke Blue Devils of the Atlantic Coast Conference (ACC) and the Canadian national team. Born in Toronto as the son of former basketball player Rowan Barrett, Barrett shone at St. Marcellinus Secondary School in Mississauga, Ontario before transferring to Montverde Academy in Montverde, Florida. He was a five-star recruit and the consensus top recruit in the 2018 class, earning Naismith Prep Player of the Year and Gatorade National Player of the Year accolades in his final high school season. Was ranked the top player in his class by all recruiting services and was the first player since LeBron James to sweep all major awards in high school and win the national championship. Barrett is expected to be a top 3 pick in the 2019 NBA draft. With the Canadian national under-19 team, Barrett was named MVP at the 2017 FIBA Under-19 Basketball World Cup after leading his team to a gold medal. He debuted for the senior team during qualification for the 2019 FIBA World Cup. Barrett was born in Toronto, Ontario to Kesha Duhaney and Rowan Barrett. Early in his childhood, he developed an interest in basketball and played with a mini-hoop in his playroom in France, where his father was playing professional basketball. While living in France, Barrett attended a French school but was taught English by his mother. He lived in a number of countries due to his father's career and shot around after games and practices. Barrett additionally played basketball with players his age through the clubs his father was a part of. His family settled in Mississauga, Ontario in 2008, when his father left professional basketball. While growing up, he was also involved in soccer, 100 metres sprinting, and the high jump. At age 12, after struggling in a basketball game and coming home crying, Barrett began focusing on basketball instead of soccer to avoid missing tournaments. At that age, he told his father that he wanted to be an NBA All-Star and make the Basketball Hall of Fame. He sometimes trained with Steve Nash, his godfather and father's friend. Barrett, under the guidance of his father, emerged as one of the best under-12 players in Ontario. He attended Horizon Jeunesse in Clarkson, Mississauga, leading his school team to a city title for Mississauga French elementary schools, where he was named most valuable player (MVP) despite facing older opponents. Barrett also played for the Regional Elite Development Academy (REDA) under-12 program on the Amateur Athletic Union (AAU) circuit, facing many teams from the United States. When he was 12, he was identified by the Ontario Basketball Association as one of the best players in his age group, and he consequently trained with the Canada Basketball junior academy, through which he competed for the Ontario provincial team. By age 15, Barrett was generally playing the point guard position. On August 3, 2014, he scored 37 points and grabbed 7 rebounds in a 93–53 win over Quebec at an under-15 provincial tournament. Through Grades 7 and 8, Barrett attended École Secondaire Jeunes Sans Frontières, a French language school in Brampton. "While we don't often give praise in the early stages of a player's career (ninth grade), Rowan Barrett Jr (2019 6'4 wing) is proving to be the exception—a cold blooded killer, still out for blood. Special." — Elias Sbiet, analyst for recruiting website North Pole Hoops, on Barrett in 2014. Barrett began high school at St. Marcellinus Secondary School in Mississauga, while competing for the Brampton Warriors AAU team through the REDA. After his 27-point effort for St. Marcellinus against Bill Crothers Secondary School on October 9, 2014, Canadian recruiting website North Pole Hoops labeled him "special" despite only being in his first year. In February 2015, he was named MVP of the Guy Vetrie Memorial tournament after scoring 41 points and a making the game-winner for REDA in a 74–72 win over BTB Academy. In April, Barrett was invited to the Region of Peel Secondary Schools Athletic Association (ROPSSAA) all-star game. At the game, he was recognized as the best prospect in the ROPSSAA. In the same month, Barrett scored a game-high 25 points in the Futures Game at the BioSteel All-Canadian Basketball Game, which featured top Grade 9 and 10 players across Canada. In September 2015, one week after touring top prep schools in the United States, Barrett announced that he would leave St. Marcellinus. Later in the month, he transferred to Montverde Academy, a school in Montverde, Florida with a decorated basketball program. Barrett made the decision in order to "take his game to another level" but described the transition as "rough." On December 7, he chipped in a team-high 18 points in a nationally televised game versus Huntington Prep School. Barrett erupted for 31 points on December 21, in a loss to Chino Hills High School at the City of Palms Classic quarterfinal. On April 15, 2016, he tallied 22 points and 8 rebounds at the 2016 Jordan Brand Classic International Game, earning game MVP honors. At the end of the season, after leading Montverde Academy in scoring, Barrett was named to the MaxPreps Freshman All-American First Team. "I love the kid. I think he's really, really talented. He can handle the ball, can get to the basketball at will; he's tough, he's competitive ... he can go both ways, offensively. Defensively he's not afraid to guard the best player on the other team. As a coach you can't ask for much more, which is why he's the camp MVP." Entering 2016–17, Barrett's sophomore season for Montverde, he was among 20 players named to the USA Today High School Sports All-USA Preseason Team. In November 2016, he was named to the Naismith Prep Player of the Year Award watch list. In December, Barrett led Montverde to a City of Palms Classic title, scoring a team-best 15 points in the finals against Memphis East High School, and received tournament MVP honors. He recorded 21 points on January 16, 2017, in a 73–67 win over Bishop Montgomery High School, to help his team win the Spalding Hoophall Classic. In February, Barrett garnered MVP accolades at Basketball Without Borders, a three-day camp during NBA All-Star Weekend. He joined the World Select Team at the 2017 Nike Hoop Summit in April, posting 9 points and 2 steals in 20 minutes. Barrett finished the season averaging 22 points and 7 rebounds per game in high school, being tabbed National Sophomore of the Year by MaxPreps and making the Naismith All-American Third Team. On July 31, 2017, Barrett reclassified to the 2018 class because he believed he was "ready to move up and to be in college a year earlier." Entering the 2017–18 season, he was named to the USA Today High School Sports All-USA Preseason Team. In his season opener on November 28, 2017, Barrett led Montverde, ranked the No. 1 team in the nation by MaxPreps, with 29 points in a 97–55 win over The Rock School. On January 11, 2018, in a nationally televised match-up with Orlando Christian Prep, he scored 24 points. Barrett posted 22 points and 10 rebounds on January 15 to defeat Mater Dei High School at the Spalding Hoophall Classic. On March 23, he played in the Signature All-Canadian Showcase, which featured 24 top Canadian prospects. 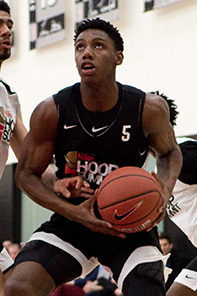 Later in the month, Barrett took part in the 2018 McDonald's All-American Boys Game, where he scored 26 points. In March 2018, Barrett was awarded the prestigious Morgan Wooten National Player of the Year award for "displaying outstanding character, showing leadership and embodying the values of a student athlete." One of the ways Barrett exhibited these attributes was by being involved in the Basketball Buddies Program of Montverde Academy, where he was in charge of mentoring young basketball athletes with their basketball skills, as well as advising them on how to manage their academics. In the 2017-18 season, he led the undefeated Montverde team to the Geico National boys’ basketball championship, recording 25 points and 15 rebounds in the championship game. Barrett scored a game-high 20 points to go along with nine rebounds, six assists and five steals at the 2018 Nike Hoop Summit and was named MVP. While attending St. Marcellinus Secondary School, Barrett was tabbed as the top Canadian prospect in the 2019 class. He received scholarship offers from several major universities including Arizona, Duke, Indiana, Kansas, Kentucky, Missouri, Oklahoma, Oregon, Texas, UCLA and USC, according to ESPN. Speaking to nbadraft.net in April 2017, Roy Rana, who coached Barrett at the 2017 FIBA Under-19 World Cup and at the Nike Hoop Summit, was quoted as saying about Barrett: "A star. A potential superstar down the road." On August 16, 2017, Barrett narrowed down to five schools: Duke, Arizona, Oregon, Kentucky, and Michigan. On November 10, 2017, he announced that he would be attending Duke for the 2018-2019 season. Commenting on his decision, he said: "It feels like home. And obviously they have a great coach ... I love Coach K. I've been watching Duke since I was really young." "Duke 2018 Basketball Commitments". Rivals.com. Retrieved June 30, 2018. "2018 Duke Blue Devils Recruiting Class". ESPN.com. Retrieved June 30, 2018. "2018 Team Ranking". Rivals.com. Retrieved June 30, 2018. Barrett made his preseason debut for Duke on August 15, 2018 in an 86–67 win over the Canadian Ryerson University Rams, scoring 34 points and collecting 5 rebounds while shooting 11-of-29 from the field. On November 6, in his first regular season game, he posted 33 points and 6 assists against No. 2-ranked Kentucky at the Champions Classic, breaking the Duke freshman scoring record in a debut. Barrett tallied his first double-double on December 5, with 27 points and 15 rebounds versus Hartford. He had another strong performance in his next game against Yale, where he recorded 30 points, 7 rebounds, and 6 assists. Barrett eclipsed the 30-point mark again on January 12, 2019, scoring 32 points in an 80–78 win over Florida State. On February 17, Barrett recorded 23 points, 11 rebounds, and 10 assists in a 94–78 win over North Carolina State. It was the fourth time in Duke history (second time under Mike Krzyzewski's tenure as head coach) where a player recorded a triple-double for the team. At the end of Duke's regular season, Barrett was named a member of both the Sporting News' All-American First Team and the All-ACC First Team alongside his teammate Zion Williamson. On March 22, Barrett led the team in both points and rebounds with 26 points and 14 rebounds in an 85–62 blowout win over #16 North Dakota State in the NCAA Tournament. Following Duke's loss in the 2019 NCAA Men's Basketball Tournament, Barrett announced his intention to forgo his final three seasons of collegiate eligibility and declare for the 2019 NBA Draft, where he is projected to be a top three pick. Barrett was the youngest player on Canada’s under-16 national team that won silver at the 2015 FIBA Americas U16 Championship, in Argentina. Pouring in 14.6 points a contest, he led his team in scoring during the tournament. He averaged 18.4 points, 4.6 rebounds and 2.3 assists per game at the 2016 FIBA U17 World Cup, in Spain, en route to eurobasket.com's All-World Cup U17 Second Team honours. In July 2017, Barrett made headlines with a 38-point, 13-rebound, and 5-assist showing as he guided Canada's under-19 squad to a 99–87 semifinal win over the US at the FIBA Under-19 Basketball World Cup. At the time, Northpolehoops.com described this performance as Barrett's "biggest game of his career so far". He subsequently led Canada to the title, tallying game-highs of 18 points and 12 rebounds in the championship game against Italy, and was named to the tournament's All-Star Five and also the tournament Most Valuable Player. Averaging 21.6 points a game, he was also the leading scorer of the tournament. In June 2018, he made his debut on Canada's senior men's national team, scoring 16 points in a 97-62 win over China. Barrett's father Rowan Barrett was born to Jamaican parents and raised in Toronto. He played college basketball for St. John's before embarking on a professional career spent in Europe and South America. Rowan Sr. was a long-time member of the Canadian national team, which he captained at the 2000 Summer Olympics, and later became executive vice president and assistant general manager for Canada Basketball. Barrett is the godson of Steve Nash, a Basketball Hall of Fame inductee who played with his father on the Canadian national team. Rowan Sr. first met Nash, who is about two years his junior, while playing for the under-19 national team and quickly became close friends with him. When Barrett was a baby, Nash bought him his first crib. Barrett's mother Kesha Duhaney is a native of Brooklyn, New York. She was a nationally ranked sprinter and long jumper for St. John's University before working for the Canadian Imperial Bank of Commerce. Barrett's parents first met while attending St. John's. His maternal aunt Dahlia Duhaney was a member of the Jamaican 4 x 100 m relay team that won a gold medal at the 1991 IAAF World Championships. Also on his mother's side, his grandparents ran track for the Jamaican national team, and his uncle played football for the University of Maryland. Barrett can speak French fluently, although he admitted to being "a little rusty" in 2018. He has a brother Nathan, who is about four years younger than him. After Barrett left high school, Nathan joined the prep basketball team at Montverde Academy. ^ a b "RJ Barrett Bio". Duke Athletics. Retrieved January 4, 2018. ^ a b c d e f Grange, Michael (August 17, 2015). "Poster Boy: Rowan Barrett Jr. Rising". Sportsnet. Retrieved January 5, 2019. ^ a b c d e f g Davis, Seth (November 8, 2017). "Canada rising: R.J. Barrett's college announcement will move him one step closer to conquering the world". The Athletic. Retrieved January 7, 2019. ^ Salvian, Haley (May 6, 2018). "Like father, like son: R.J. and Rowan Barrett". CBC. Retrieved January 6, 2019. ^ a b c Ewing, Lori (July 31, 2017). "Canadian basketball star R.J. Barrett to jump a year ahead to join Class of 2018". The Globe and Mail. Retrieved January 5, 2019. ^ a b Medcalf, Myron (January 8, 2019). "RJ Barrett inherited a Canada that Vince Carter built". ESPN. Retrieved January 9, 2019. ^ Colpitts, Iain (August 29, 2011). "Like father, like son". The Mississauga News. Retrieved January 5, 2019. ^ Sbiet, Tariq (August 3, 2014). "Team Ontario 15s Prove Dominance, Rowan Barrett Jr Explodes for 37". North Pole Hoops. Retrieved January 5, 2019. ^ Vallière, Kim (July 2, 2018). "R.J. Barrett, possible premier choix de la NBa et francophone" (in French). Retrieved January 6, 2019. ^ a b c Sbiet, Elias (October 9, 2014). "Rowan Barrett Jr Proving To Be Special". North Pole Hoops. Retrieved January 9, 2019. ^ Acquisto, Stella (September 21, 2015). "Canada's next great hoops star has championship pedigree". CityNews. Retrieved January 9, 2019. ^ Coccimiglio, Brad (February 8, 2015). "Senior final goes down to the wire at Guy Vetrie Memorial". Soo Today. Retrieved January 9, 2019. ^ Colpitts, Iain (April 2, 2015). "Local players selected for Peel All-Star Game". The Mississauga News. Retrieved January 9, 2019. ^ Juzenas, Frank. "Buzzer-beater wins all-star game". Brampton Guardian. Retrieved January 9, 2019. ^ "Murray, Poyser MVPs of BioSteel All-Canadian game". Sportsnet. April 14, 2015. Retrieved January 9, 2019. ^ Colpitts, Iain (April 15, 2015). "Poyser, Barrett shine in Biosteel All Canadian showcase". The Mississauga News. Retrieved January 9, 2019. ^ Ebanks, Drew (September 21, 2015). "St. Marcellinus Spirit not joining newly formed OSBA". On Point Basketball. Retrieved January 9, 2019. ^ Okrainetz, Chris (September 23, 2015). "Canada's Top Prospect Rowan Barrett Jr. Heading to Montverde Academy". Tip of the Tower. Retrieved January 9, 2019. ^ Gardenour, Jeff (January 25, 2017). "Soph sensation R.J. Barrett leads Montverde". Orlando Sentinel. Retrieved January 9, 2019. ^ DelGallo, Alicia (December 7, 2015). "Montverde shows off with win for ESPN". Orlando Sentinel. Retrieved January 9, 2019. ^ Halley, Jim (December 21, 2015). "No. 2 Chino Hills edges No. 1 Montverde in City of Palms quarterfinal". USA Today High School Sports. Retrieved January 9, 2019. ^ Halley, Jim (April 15, 2016). "Nigerian Charles Bassey makes up for late start, lifts Black team in International game at Jordan Classic". USA Today High School Sports. Retrieved January 9, 2019. ^ Hickman, Jason (April 21, 2016). "2015-16 MaxPreps Boys Basketball Freshman All-American Team". MaxPreps. Retrieved January 9, 2019. ^ Halley, Jim (October 20, 2016). "2016-17 American Family Insurance ALL-USA Preseason Boys Basketball Team". USA Today High School Sports. Retrieved January 10, 2019. ^ "Naismith Trophy High School Boys All-America team announced". USA Today High School Sports. March 8, 2017. Retrieved January 10, 2019. ^ Halley, Jim (December 21, 2016). "No. 4 Montverde Academy wins its third City of Palms title". USA Today High School Sports. Retrieved January 10, 2019. ^ "Montverde Academy holds off Bishop Montgomery for win at Spalding Hoophall Classic". MaxPreps. January 16, 2017. Retrieved January 10, 2019. ^ Grange, Michael (February 19, 2017). "Rowan Barrett Jr. among several Canadians with all-star potential". Sportsnet. Retrieved January 10, 2019. ^ "Nike Hoop Summit Box Scores". USA Basketball. Retrieved January 10, 2019. ^ "World Select Team Announced For 2017 Nike Hoop Summit". USA Basketball. March 15, 2017. Retrieved January 10, 2019. ^ "2016-17 MaxPreps Boys Basketball Sophomore All-American Team". MaxPreps. April 13, 2017. Retrieved January 10, 2019. ^ "Naismith High School Boys' All-American Team Announced". Naismith Trophy. March 8, 2017. Retrieved January 10, 2019. ^ Weinstein, Josh (July 31, 2017). "'I'm right on track': Canada's R.J. Barrett reclassifies for 2019 NBA draft". Toronto Sun. Retrieved January 12, 2019. ^ Halley, Jim (November 27, 2017). "2017-18 American Family Insurance ALL-USA Preseason Boys Basketball Team". USA Today High School Sports. Retrieved January 13, 2019. ^ Stover, Tyler (November 28, 2017). "Montverde pounds The Rock". Orlando Sentinel. Retrieved January 13, 2019. ^ Fay, Max (January 11, 2018). "R.J. Barrett and Nassir Little show off on big stage". Orlando Sentinel. Retrieved January 13, 2019. ^ Halley, Jim (January 15, 2018). "No. 1 Montverde Academy coasts past Mater Dei". USA Today High School Sports. Retrieved January 13, 2019. ^ "RJ Barrett Headlines Inaugural Signature All Canadian Showcase, NBA Certified Event". North Pole Hoops. March 23, 2018. Retrieved January 13, 2019. ^ Daniels, Evan (March 28, 2018). "McDonald's Recap: Nassir Little, R.J. Barrett steal the show". 247Sports. Retrieved January 13, 2019. ^ "McDonald's All American Games Announces The 2018 Morgan Wootten Player Of The Year Award Winners". Retrieved April 4, 2018. ^ "RJ Barrett Named 2018 Morgan Wootten Player Of The Year". SLAMonline. March 13, 2018. Retrieved April 4, 2018. ^ "R.J. Barrett, Montverde Academy add 'cherry on top' with GEICO Nationals crown - MaxPreps". MaxPreps.com. March 31, 2018. Retrieved April 19, 2018. ^ "Canada Basketball". www.basketball.ca. Retrieved April 18, 2018. ^ Hickman, Jason (November 10, 2015). "MaxPreps 2015-16 High School Basketball Early Contenders". MaxPreps. Retrieved January 9, 2019. ^ "2017 Nike Hoop Summit: World Team Recap | NBADraft.net". www.nbadraft.net. Retrieved July 12, 2017. ^ "New No. 1 recruit R.J. Barrett announces list of 5 finalists". SBNation.com. Retrieved August 17, 2017. ^ "Canada's top-ranked prospect Barrett chooses Duke - Article - TSN". TSN. November 10, 2017. Retrieved November 11, 2017. ^ "Duke Recruiting RJ Barrett Will Be A Blue Devil". Duke Basketball Report. Retrieved November 11, 2017. ^ Boone, Kyle (August 16, 2018). "Duke's Zion Williamson, R.J. Barrett lead Blue Devils to exhibition rout of Ryerson". CBS Sports. Retrieved August 19, 2018. ^ "Canada's R.J. Barrett breaks Duke record in sizzling college debut". CBC. November 7, 2018. Retrieved January 12, 2019. ^ McCreary, Joedy (December 6, 2018). "RJ Barrett leads No. 3 Duke past Hartford, 84-54". Hartford Courant. Retrieved January 12, 2019. ^ Lindqwister, Winston (December 8, 2018). "R.J. Barrett, stellar defense drive offense as Duke men's basketball takes down Yale". The Chronicle. Retrieved January 12, 2019. ^ Daniels, Tim (January 12, 2019). "RJ Barrett, Duke Beat FSU on Cam Reddish Winner; Zion Williamson Drops 11". Bleacher Report. Retrieved January 12, 2019. ^ "Duke F RJ Barrett enters 2019 NBA draft". Yahoo Sports. April 10, 2019. ^ "FIBA AMERICAS". www.fibaamericas.com. Retrieved July 9, 2017. ^ "Rowan Barrett profile, FIBA U17 World Championship 2016 | FIBA.COM". FIBA.COM. Retrieved July 9, 2017. ^ "World Championships U17 Basketball, Teams, Scores, Stats, News, Standings - eurobasket". www.eurobasket.com. Retrieved July 9, 2017. ^ "Canada slay USA dragon to reach historic Final". FIBA.basketball. Retrieved July 9, 2017. ^ "R.J. Barrett shakes the world in Canada's historic win over USA". Northpolehoops.com. July 8, 2017. Retrieved July 9, 2017. ^ "Canada routs Italy to capture gold at FIBA U19 Basketball World Cup - Sportsnet.ca". Sportsnet.ca. Retrieved July 9, 2017. ^ "Barrett named MVP after winning Canada's first U19 title". FIBA.basketball. Retrieved July 10, 2017. ^ "Players statistics of the FIBA U19 Basketball World Cup 2017 - FIBA.basketball". FIBA.basketball. Retrieved July 12, 2017. ^ June 23, Jim Morris · The Canadian Press ·. "R.J. Barrett leads Canada to victory in national team debut | CBC Sports". CBC. Retrieved December 8, 2018. ^ "Former SJU Star Rowan Barrett Leading Team Canada". St. John's University Athletics. September 19, 2000. Retrieved January 6, 2019. ^ a b "Catch you on the rebound: Rowan Barrett". Canada Basketball. Retrieved January 6, 2019. ^ Gay, Carlan (December 6, 2018). "Executive VP Rowan Barrett praises players' commitment after qualifying for FIBA Basketball World Cup 2019". NBA. Retrieved January 6, 2019. ^ "Point guards Steve Nash, Jason Kidd and Maurice Cheeks among Hall inductees". ESPN. September 8, 2018. Retrieved January 7, 2019. ^ Pecar, Steve (March 9, 2018). "Mississauga's Barrett receives top basketball honour". Peel Region Review. Retrieved January 6, 2019. ^ "Five things to know about rising Canadian basketball star R.J. Barrett". Sportsnet. November 10, 2017. Retrieved January 6, 2019. ^ Ewing, Lori (August 10, 2018). "R.J. Barrett to make Duke debut in hometown of Toronto". CBC. Retrieved January 8, 2018. ^ "Nathan Barrett". Montverde Academy. Retrieved January 8, 2019.